We are one of the experience Nebosh course provider in the worldwide market. We are seeing an increasing demand for this prestigious safety qualification. 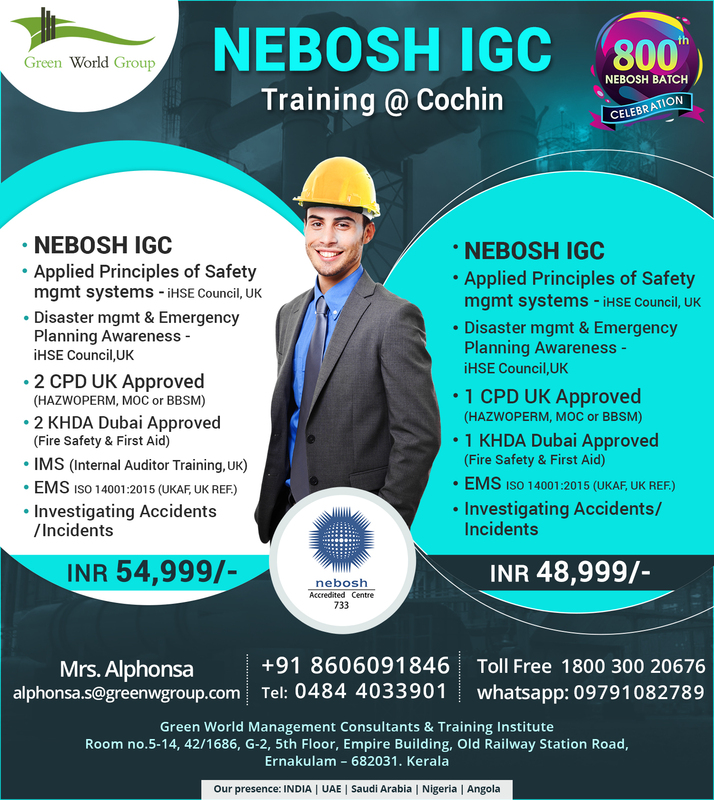 As India first accredited provider of the NEBOSH IGC our customers can put full faith in us that they will get their certificates and that they do not need to deal with any intermediaries for booking themselves on the course. Contact us today to find out why so many safety officers/supervisors, etc in the India are option to take this safety qualification. What is the pass mark for NEBOSH IGC? This is one of the FAQ by each and every IGC candidate. The NEBOSH IGC contains 3 units, IGC 1 (Health and Safety Management system), IGC 2 (Hazard/Risk identification and control), and IGC 3 (Practical assessment). The minimum mark to pass IGC 1 and GC 2 is 45% and GC 3 is 60%. In order to pass in NEBOSH, You should clear all the three units individually because NEBOSH have not set any gradual score to pass the exams. Do remember while preparing for the exams. As I have already posted some articles which will assist you to pass your NEBOSH IGC at first attempt. I have complete in BA. & I join the PG.dip.in safety officer course. Pl’s send me full information in this course.i really thankful to you. Greetings from IDMFS – Associates of GWG !!! Please contact over phone 09915327336 for detailed information about your all enquiries. I am Mechanical Engg. Can i do this ? I m sanjeev Kumar and complete b. A plz tell me safety class information my no.. Thanks for the enquiry. Our Product specialist will contact you shortly. m intersted join nebosh igc classes… so plz contact wth me nd giving me full info regarding nebosh. Thanks for the enquiry. Our product specialist will contact you regarding this. I want go dubai to earn money. I have done post graduate diploma of computer application 2014. Please recommend me any course according to your experience. Thanks for the enquiry. Our Product specialist will contact you shorlty. Actually i had done my +2 in 2011 and after that i was doing BTech From lovely professional university but i just quit my studies in my final semester . so now m planing to join Nebosh course ..so plz explain me in details all the procedure and necessary details ?? I would like to take an International Certification Course in Construction Safety by NEBOSH. Is there any chance to get it done in Punjab between 20/12/2015 to 31/01/2016. I m completed my MBA in Safety management from Annamalai University through NIFS institute Chandigarh. Now m working in MFG. company as a Safety Officer last 1.6 years. I want to learn more in this (Safety) field & also want to go Dubai in future for work. can u plz tel me that what kind of course i’ll do in NEBOSH. Thanks for contact us…we will contact you shortly. HHii sir/mam this is rahil .. I want to knw about safety officer courses and get full detail ..plz contact me I want to get this course .. its my number. ..
Dear Sir/Madam I want to know about the course of Nebosh HSW is available in your institute. Dear Sir/Madam I want to know about the course of Nebosh HSW, IOSH and IGC is available in your institute. Thanks for your enquiry..we will contact you shortly.. Thanks for contact us. we will send course details through your mail. This is Satendra Singh have a PGDISM one year course, and working in a company. I want to do NEBOSH International diploma in Occupational Health and Safety. Is this course is cover in your respective institute , kindly provide info or contact. Thanks for your enquiry. i could call arrange from our marketing team. I am a retired person from the Indian Army as a rank of Hornory Captain in Oct 2015. I want to do international job as a safety officer in abroad that’s why I want to get experiences of safety officer . Do I join safety officer course through your institute? If yes plz send all the details in my mail add and my mail ID is rajrana0994@gmail.com. Thanks for your enquiry. we will send a mail in short period of time. Thanks for your enquiry. we will send all details in a short while. Hi I am sarwan kumar now I am working in dubai as a safety assistant I have done Iosh in Dubai now I want do nebosh please let me know obout ur location in Chandigarh and duration of course. Thanks for your enquiry. we will send all details over through your mail.